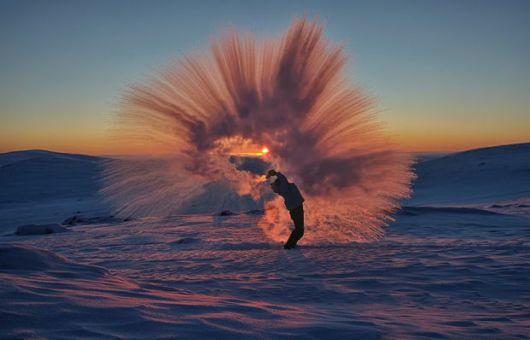 The science behind this amazing photo from Ontario-based photographer Michael Davies is already well known, but seeing it in action against a sunny backdrop is truly beautiful. Davies was in the fly-in community of Pangnirtung in Canada?s High Arctic with his friend Markus, just 20km from the Artic Circle. 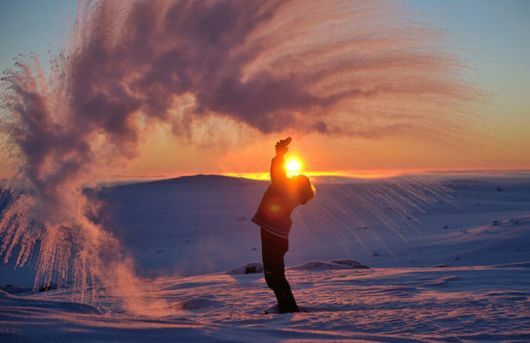 Armed with multiple flasks of hot water they both set off to capture the moment Markus throws hot water into the -40°C air. 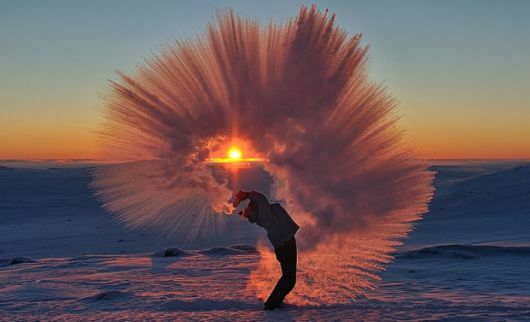 The water freezes almost instantly resulting in the spectacular plumes you see below. Prepared with multiple thermoses filled with tea, we began tossing the water and shooting. Nothing of this shot was to chance, I followed the temperature, watched for calm wind, and planned the shot and set it up. Even the sun in the middle of the spray was something I was hoping for, even though it?s impossible to control.